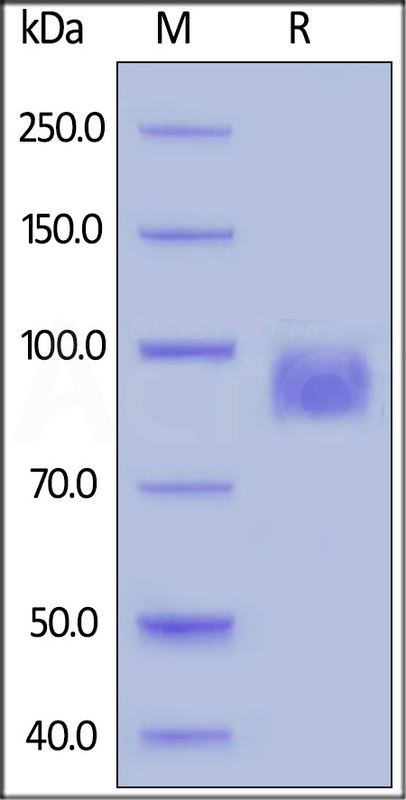 MABSol® Biotinylated Human Her2 / ErbB2, Superior Sensitivity (HE2-H822R) is expressed from human HEK293 cells. It contains AA Thr 23 - Thr 652 (Accession # AAA75493). It is the biotinylated form of Human Her2 / ErbB2 Protein (Cat. No. HE2-H5225). This protein carries a polyhistidine tag at the C-terminus. The protein has a calculated MW of 70.2 kDa. The protein migrates as 95-110 kDa on a SDS-PAGE gel under reducing (R) condition due to glycosylation. The primary amines in the side chains of lysine residues and the N-terminus of the protein are conjugated with biotins using standard chemical labeling method. A specially optimized long-spacer biotin reagent (32.5 angstroms) is used in this product to minimize potential steric hindrance. The biotin to protein ratio is 1.5-3.5 as determined by the HABA assay. Biotinylated Human Her2, His Tag on SDS-PAGE under reducing (R) condition. The gel was stained overnight with Coomassie Blue. The purity of the protein is greater than 95%. 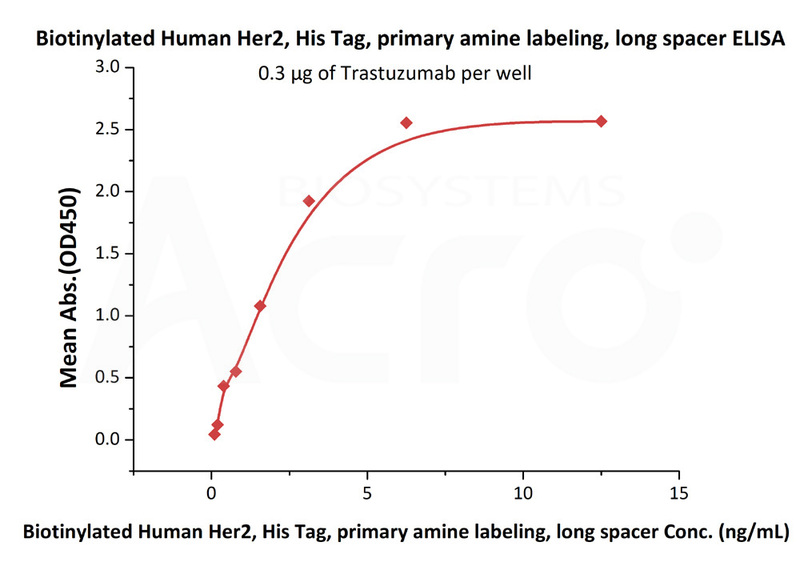 Immobilized Trastuzumab at 3 μg/mL (100 μL/well) can bind Biotinylated Human Her2, His Tag (Cat. No. HE2-H822R) with a linear range of 0.1-3.1 ng/mL (QC tested). Immobilized Herceptin on SA Biosensor via Biotinylated Her2 Protein (Cat. No. HE2-H822R), can bind Human FcRn / FCGRT & B2M Heterodimer Protein (Cat. No. 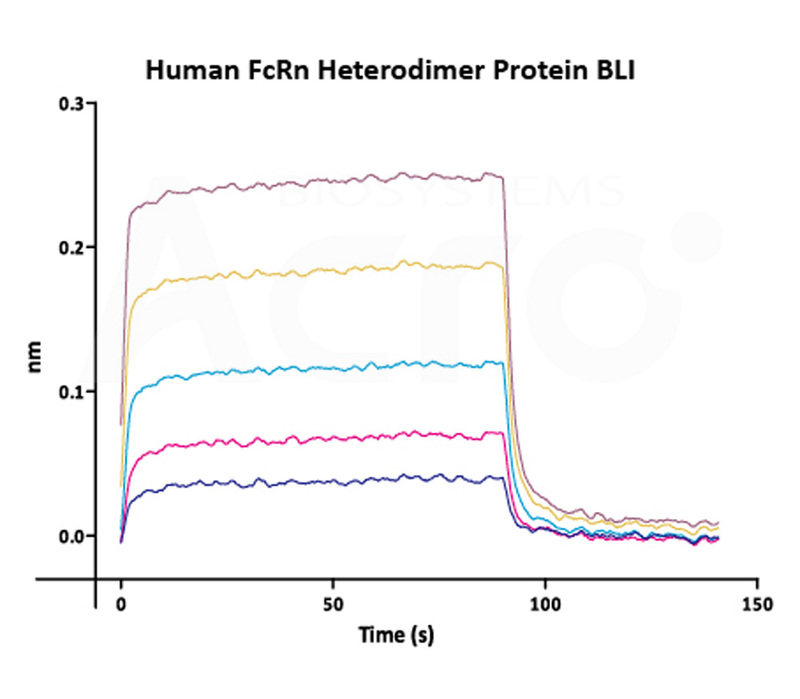 FCM-H5286) with an affinity constant of 1.32 μM as determined in BLI assay (Fortebio Octet 96) ( Routinely tested). Authors: Mortensen MR, et al. Authors: Kim Young Min, et al.